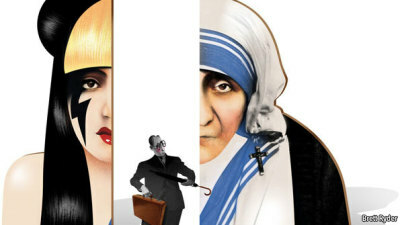 The Economist compares Lady Gaga to Mother Teresa (of all people)! Can you imagine?! Lady Gaga has done nothing but corrupt souls, while Mother Teresa has given nothing but blessing! It’s really a silly, pointless no comparison. Previous Post Why Did Moses Go Up Mount Sinai Twice? Isa. 5: 20 yet again! This article about GaGa’s recent song ‘Judas’ might interest you. I also wrote a blog entry recently about the aggressive marketing tactics and all round inauthenticity of ‘Brand GaGa’ if you want to check it out.